Over one hundred years ago there was one woman called Love, who had a daughter named Ellen and then lived at a place still called "Nell Cote," near Lobmill, Stansfield, where they carried on the practice of free love for so long a time that the younger woman eventually became "Old Nell o' the' Lovies;" the latter being known all her life as a free and easy-going person, and it was even said in those days - to use a common expression - that "hool" (wool) buyers knew where "hool-sellers" lived. One man, well-known by the name of Davey, who although he had a wife and family at home, yet was so beguiled by the charms of this lady that he frequently visited Nell. Davey kept a public house in the valley, having also a farm to attend to as well; but his wife was aware of his infidelity to her and so became observant of his goings and comings, so, on a day when he returned home again, she enquired where he had been, to which he answered "With the stirks (young cattle) on to Langfield moor." To that reply she was ready with another query, "Done they wear grey cloaks then?" An ancient custom for a Todmorden tradesman over sixty years ago, when he had been drinking and neglecting his work. The stang rider was generally a selected lad - voluble, bold and fearless, who mounted the stang first in front of the inn where the offence had been committed, and was afterwards carried round the village, the ceremony being gone through at public houses and other places; then there was a shout and collection of money. The great house built at Croft Gate (Yate), in Langfield, dated 1595, is one of the early specimens remaining in the township of what masons could do in those old times, being still in an excellent state of preservation, the outer walls built of well wrought Ashlar stone nearly three feet in thickness, and having deeply recessed mullioned windows. From its outward appearance the place would seem to have at a former period belonged to a well-to-do family, as a good piece of land near was once occupied as a garden, containing many fruit and other trees. 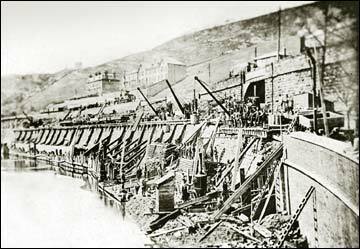 More on "Old Todmorden" in issue 12 of "Milltown Memories", including how Gauxholme got its name - and rioting navvies!